Profoundly Seth: Fair Weather! Finally! The past few days have been relatively warm out, which is very, very exciting to me. Last night I made a night time run for ice cream for my aunt and I. A shoeless run, of course, because the kids have somehow hidden the one pair of shoes I brought with me and developed selective amnesia about where they are. When the ice cream place I was craving was closed (Zesto, for you locals), I called my aunt, slightly panicked. "Zesto is closed! And I can't go to Wal-mart for ice cream because I don't have any shoes! And I need ice cream!" Luckily Steak and Shake has a sundae, that's all I have to say. 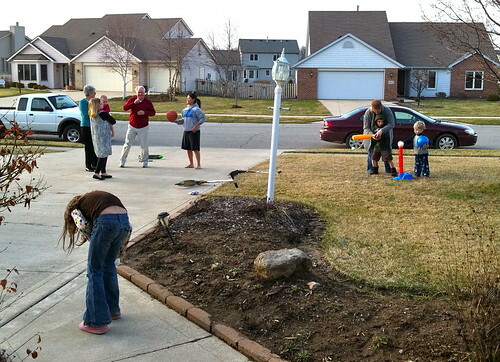 Today My cousin Aubrey and her daughter, Caedren came over to hang out and we all went to play out in the front yard. And then my great Aunt and Uncle drove by on their way home and stopped to hang out, too. Apparently, this is life in a small town. And it could just be me, but I'm reasonably sure my Uncle Butch is doing a cha-cha in the background, there. And Ava is bent over like that because she fell down and skinned her knee. Of course. Because why wouldn't she? But I love that we live close enough to my cousin and her family to have them over for pizza whenever and that when we play outside we are likely to see people we know drive by. These are the great things about living here. But someone needs to tell Miss Evany Jane to walk already! She is tearing her knees up on this carpet and I am completely convinced she has the ability to walk but she just refuses to do it. She needs to give up the ghost and take some steps! She stood on her own for nearly a minute the other day but she won't take a single step. I'm a little worried she inherited some of Seth's stubbornness. Tonight when we were outside she kept insisting on being down on the ground and crawling down the sidewalk. She's so weird.